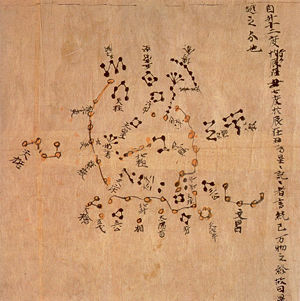 Star Map from the Tang Dynasty (North Polar region). This map is thought to date from the reign of Emperor Zhongzong of Tang (705-710). Found in Dunhuang, Gansu. Constellations of the three schools were distinguished with different colors: white, black and yellow for stars of Wuxian, Gan De and Shi Shen-fu respectively. The whole set of star maps contained 1,300 stars. Astronomy in China has a very long history. Oracle bones from the Shang Dynasty (second millennium B.C.E.) record eclipses and novae. Detailed records of astronomical observations were kept from about the sixth century B.C.E. until the introduction of Western astronomy and the telescope in the sixteenth century. The practice of astronomy in China was fundamentally changed by extended contact with Western astronomy. Today, China continues to be active in astronomy, with many observatories and its own space program. Formerly the sage-kings, wishing to trace the ways of heaven, and to fix the sublime tracks (the paths of the heavenly bodies), and to ascertain the origins of things, first set up a celestial sphere, thus rectifying their instruments and establishing degrees, so that the imperial pole was fixed. All turned round the heavenly axis in a reliable way which could be studied. After this was set up and observed, it was seen that heaven had a normal regularity (常). One of the main functions was for the purpose of timekeeping. The Chinese used a lunisolar calendar, but because the cycles of the Sun and the Moon are different, intercalation had to be done. The Chinese calendar was considered to be symbol of a dynasty. As dynasties would rise and fall, astronomers and astrologers of each period would often prepare a new calendar to be made, with observations for that purpose. The calendar was used as far back as the fifth century B.C.E. and underwent more than 100 reforms. That explains the great interest which the Jesuits arose in China with their knowledge of calendrical science, for example Matteo Ricci having learned directly from the German mathematician-astronomer Christopher Clavius who did the Gregorian calendar for the Western world. Also Chinese scientists were astonished in the seventeenth century when Adam Schall or Verbiest could better predict the eclipses than the Chinese. Chinese astronomy was essentially polar and equatorial, depending largely on observations of the circumpolar stars, while Greek and medieval European astronomy had been essentially ecliptic, depending largely on heliacal risings and settings of zodiacal constellations. Astrological divination was also an important part of astronomy. Astronomers took careful note of "guest stars" which suddenly appeared among the fixed stars. The supernova that created the Crab Nebula in 1054 is an example of a guest star observed by Chinese astronomers, recorded also by the Arabs, although it was not recorded by their European contemporaries. Ancient astronomical records of phenomena like supernovae and comets are sometimes used in modern astronomical studies. On a larger scale it is important to mention that as early as 3000 B.C.E. the Chinese practiced the divination with tortoise shells that symbolized the cosmos. The reading of cracks on these shells allowed the prevision of events in relation to a cosmic background. The formation of the Chinese characters much related to nature was done in this context of divination. The divisions of the sky began with the Northern Dipper and the 28 mansions. In early 1980s, a tomb was found at Xi Shui Po (西水坡) in Pu Yang, Henan Province. There were some clamshells and bones forming the images of the Azure Dragon, the White Tiger and the Northern Dipper. It is believed that the tomb belongs to the Neolithic Age, about 6,000 years ago. Star names relating to the 28 lunar mansions were found on oracle bones dating back to the Wuding Period, about 3,200 years ago. In 1978, a lacquer box was excavated from the tomb of Zeng Hou Yin in Suixian, Hubei Province. Names of the 28 lunar mansions were found on the cover of the box, proofing that the use of this classification system was made before 433 B.C.E. As lunar mansions have such an ancient origin, the meaning of most of their names has become obscure. Even worse, the name of each lunar mansion consists of only one Chinese word, and the meaning of it could vary at different times in history. So the meaning of the names is sill under discussion. Besides the 28 lunar mansions, most constellations are based on the works of Shi Shen-fu and Gan De, who were astrologists during the period of the Warring States (481 B.C.E. - 221 B.C.E.) in China. In the late period of the Ming Dynasty, the agricultural scientist and mathematician Xu Guangqi (1562 - 1633 C.E.) introduced 23 additional constellations which are near to the Celestial South Pole, which are based on star catalogues from the West (see Matteo Ricci). Unlike the West, where the starry sky is a pantheon of Greek legendary heroes and mystic creatures, the Chinese treat the heavens as a miniature of their earthly world, a reflection of their feudal society. It could be said also that wondering at the starry cosmos showinf order they reflected on how to develop an ordered society. North and south of the equator there are 124 groups which are always brightly shining. 320 stars can be named (individually). There are in all 2500, not including those which the sailors observe. Of the very small stars there are 11,520. All have their indulgences on fate. The astronomer Guo Shoujin of the Yuan Dynasty (1279 - 1368 C.E.) created a new catalogue which was believed to contain thousands of stars. Unfortunately, many of documents at that period were destroyed, including that of Shoujin. Imperial Astronomical Instruments (儀象考成) published in 1757 containing 3083 stars exactly. A star map with Mercator projection, from Su Song's Xin Yi Xiang Fa Yao, 1092. Although many others were drawn before him, Su Song's star maps represent the oldest existent ones in printed form. The Chinese drew many maps of stars in the past centuries, yet the oldest existent star map in printed form is from Su Song's (1020-1101 C.E.) celestial atlas of 1092 C.E., which was included in the horological treatise on his clocktower. The most famous one is perhaps the map found in Dunhuang, Gansu. Uncovered by the British archaeologist Marc Aurel Stein in 1907, the star map was brought to the British Museum in London. The map was drawn on paper and represents the complete sky with more than 1,350 stars. Though ancient Babylonians and Greeks also observed the sky and catalogued stars, no such complete record of the stars may exist or survive. Hence this is the oldest chart of the actual skies in the present. Stars appearing on the chart were marked with three colors: black for the stars of Gan, yellow for the stars of Shi, and white fore the stars of Wuxian. According to recently studies, the map may date the manuscript to as early as the seventh century (Tang Dynasty). Scholars believe the star map dating from 705 to 710 C.E., which is the reign of Emperor Zhongzong of Tang. Some experts from the West think the chart may be a copy of an earlier existing document. There are some texts (Monthly Ordinances, 月令) describing the movement of the sun among the sky each month, which was not based on the observation at that time. An extraordinary Chinese planisphere who had been prepared in 1195 was engraved on stone in 1247 and is called the Suchow planisphere. The inscription accompanying it was translated into French by Chavannes and into English by Rufus and Tien. The sun is like fire and the moon like water. The fire gives out light and the water reflects it. Thus the moon's brightness is produced from the radiance of the sun, and the moon's darkness (pho) is due to (the light of) the sun being obstructed (pi). The side which faces the sun is fully lit, and the side which is away from it is dark. The planets (as well as the moon) have the nature of water and reflect light. The light pouring forth from the sun (tang jih chih chhung kuang) does not always reach the moon owing to the obstruction (pi) of the earth itself—this is called 'an-hsü', a lunar eclipse. When (a similar effect) happens with a planet (we call it) an occulation (hsing wei); when the moon passes across (kuo) (the sun's path) then there is a solar eclipse (shih). If they were like balls they would surely obstruct each other when they met. I replied that these celestial bodies were certainly like balls. How do we know this? By the waxing and waning of the moon. The moon itself gives forth no light, but is like a ball of silver; the light is the light of the sun (reflected). When the brightness is first seen, the sun (-light passes almost) alongside, so the side only is illuminated and looks like a crescent. When the sun gradually gets further away, the light shines slanting, and the moon is full, round like a bullet. If half of a sphere is covered with (white) powder and looked at from the side, the covered part will look like a crescent; if looked at from the front, it will appear round. Thus we know that the celestial bodies are spherical. I answered that the ecliptic and the moon's path are like two rings, lying one over the other, but distant by a small amount. (If this obliquity did not exist), the sun would be eclipsed whenever the two bodies were in conjunction, and the moon would be eclipsed whenever they were exactly in position. But (in fact) though they may occupy the same degree, the two paths are not (always) near (each other), and so naturally the bodies do not (intrude) upon one another. The earliest development of the armillary sphere in China goes back to the astronomers Shi Shen and Gan De in the 4th century B.C.E., as they were equipped with a primitive single-ring armillary instrument. This would have allowed them to measure the north polar distance (去極度, the Chinese form of declination) and measurement that gave the position in a hsiu (入宿度, the Chinese form of right ascension). During the Western Han Dynasty (202 B.C.E. - 9 C.E.) additional developments made by the astronomers Luo-xia Hong (落下閎), Xiangyu Wang-ren, and Geng Shou-chang (耿壽昌) advanced the use of the armillary in its early stage of evolution. In 52 B.C.E., it was the astronomer Geng Shou-chang who introduced the first permanently fixed equatorial ring of the armillary sphere. In the subsequent Eastern Han Dynasty (23-220 C.E.) period, the astronomers Fu An and Jia Kui added the elliptical ring by 84 C.E. With the famous statesman, astronomer, and inventor Zhang Heng (78-139 C.E. ), the sphere was totally complete in 125 C.E., with horizon and meridian rings. It is of great importance to note that the world's first hydraulic (i.e., water-powered) armillary sphere was created by Zhang Heng, who operated his by use of an inflow clepsydra clock (see Zhang's article for more detail). Designed by famous astronomers Guo Shoujing in 1276 C.E., it solved most problems found in armillary spheres at that time. The double-ring holds within itself a sighting tube with crosshairs. When observing, astronomers aim the star with the sighting tube, stars’ position can be read out at the dials of the equatorial ring and the right ascension double-ring. A foreign missionary melted the instrument in 1715 C.E. The survived one was built in 1437 C.E., and was taken by Germany and stored in France Embassy in 1990 during Eight-Nation Alliance. Under the pressure of international public voice the German returned it to China. In 1933 it was placed in Purple Mountain Observatory for preventing it being destroy in war. In the 1980s it had already been eroded seriously and was nearly destroy. To deal with it Nanjing government spent 11 months to repair it. Besides star maps, the Chinese also make Celestial globes, which show stars position liked a star map and can present the actual sky in a specific time. Because of its Chinese name, the Chinese always make it up with Armillary sphere, which is just one word different (渾象 vs. 渾儀). According to records, the first Celestial globe was made by Geng Shou-chang (耿壽昌) between 70 B.C.E. and 50 B.C.E. In Ming Dynasty, celestial globe at that time was a huge globe, showing with the 28 mansions, celestial equator and ecliptic. But just like many other equipment, none of them survived. Celestial globe was named 天體儀 in Qing Dynasty. The one in Beijing Ancient Observatory was made by Belgian missionary Ferdinand Verbiest (南懷仁) 1673 C.E. Unlike other Chinese celestial globes, it employs 360 degrees rather than the 365.24 degrees (which is a standard in ancient China). It is also the Chinese-first globe which shows constellations near to the Celestial South Pole. The first to invent the hydraulic-powered armillary sphere was Zhang Heng (78-139 C.E.) of the Han Dynasty. Zhang was well-known for his brilliant applications of mechanical gears, as this was one of his most impressive inventions (alongside his seismograph to detect the cardinal direction of earthquakes that struck hundreds of miles away). Started by Su Song (蘇頌) and his colleagues in 1086 C.E. and finished in 1092 C.E., his large astronomical clock tower featured an armillary sphere (渾儀), a celestial globe (渾象) and a mechanical chronograph. It was operated by an escapement mechanism and the earliest known chain drive. However 35 years later the invading Jurchen army dismantled the tower in 1127 C.E. upon taking the capital of Kaifeng. The armillary sphere part was brought to Beijing, yet the tower was never successfully reinstated, not even by Su Song's son. Fortunately two versions of Su Song’s treatise written on his clock tower have survived the ages, so that studying his astronomical clock tower is made possible through medieval texts. The polymath Chinese scientist Shen Kuo (1031-1095) was not only the first in history to describe the magnetic-needle compass, but also a more accurate measurement of the distance between the polestar and true north that could be used for navigation. Shen achieved this by making nightly astronomical observations along with his colleague Wei Pu, using Shen's improved design of a wider sighting tube that could be fixed to observe the polestar indefinitely. Along with the polestar, Shen Kuo and Wei Pu also established a project of nightly astronomical observation over a period of five successive years, an intensive work that would even rival the later work of Tycho Brahe in Europe. Shen Kuo and Wei Pu charted the exact coordinates of the planets on a star map for this project, and created theories of planetary motion, including retrogradation. The introduction of Western science to China by Jesuit priest astronomers was a mixed blessing during the late sixteenth century and early seventeenth century. It has been said that the Jesuits like Gaubil (1663-1738) relied too much on legendary materials. Some Jesuits who wanted to make a forced rapprochement with the Bible and the Christian teaching had sometimes strange theories on the Book of Changes or on language. Telescope was introduced to China in the early seventeenth century. The telescope was first mentioned in Chinese writing by Emanuel Diaz (Yang Ma-Nuo), who wrote his Tian Wen Lüe in 1615. In 1626 Adam Schall von Bell (Tang Ruo-wang) published the Chinese treatise on the telescope known as the Yuan Jing Shuo (The Far-Seeing Optic Glass). The Chongzhen Emperor (明思宗, 1627-1644) of the Ming Dynasty acquired the telescope of Johannes Terrentius (or Johann Schreck; Deng Yu-han) in 1634, ten years before the collapse of the Ming Dynasty. However, the impact on Chinese astronomy was limited. The Jesuit China missions of the sixteenth and seventeenth centuries brought Western astronomy, then undergoing its own revolution, to China. After the Galileo affair early in the seventeenth century, the Roman Catholic Jesuit order was required to adhere to geocentrism and ignore the heliocentric teachings of Copernicus and his followers, even though they were becoming standard in European astronomy. Thus, the Jesuits shared an Earth-centered and largely pre-Copernican astronomy with their Chinese hosts (i.e. the inaccurate Ptolemaic-Aristotelian views from Hellenistic times). The Chinese were often fundamentally opposed to this as well, since the Chinese had long believed (from the ancient doctrine of Xuan Ye) that the celestial bodies floated in a void of infinite space. This contradicted the Aristotelian view of solid concentric crystalline spheres, where there was not a void, but a mass of air between the heavenly bodies. Of course, the views of Copernicus, Galileo, and Tycho Brahe would eventually triumph in European science, and these ideas slowly leaked into China despite Jesuit efforts to curb them in the beginning. In 1627, the Polish Jesuit Michael Boym (Bu Mi-ge) introduced Johannes Kepler's Copernican Rudolphine Tables with much enthusiasm to the Ming court at Beijing. In Adam Schall von Bell's Chinese-written treatise of Western astronomy in 1640, the names of Copernicus (Ge-Bai-Ni), Galileo (Jia-li-lüe), and Tycho Brahe (Di-gu) were formally introduced to China. There were also Jesuits in China who were in favor of the Copernican theory, such as Nicholas Smogulecki and Wenceslaus Kirwitzer. However, Copernican views were not widespread or wholly accepted in China during this point. In Japan, the Dutch aided the Japanese with the first modern observatory of Japan in 1725, headed by Nakane Genkei, whose observatory of astronomers wholly accepted the Copernican view. In contrast, the Copernican view was not accepted in mainstream China until the early nineteenth century, with the Protestant missionaries such as Joseph Edkins, Alex Wylie, and John Fryer. ↑ 11.0 11.1 Needham, 415-416. ↑ 12.0 12.1 12.2 12.3 12.4 Needham, 343. ↑ 13.0 13.1 13.2 13.3 Needham, 444. ↑ 15.0 15.1 15.2 15.3 Needham, 438-439. ↑ 17.0 17.1 Needham, 447. Sun Xiaochun. Crossing the Boundaries Between Heaven and Man: Astronomy in Ancient China, in Selin, Helaine, and Xiaochun Sun. 2000. Astronomy across cultures: the history of non-Western astronomy. Science across cultures, v. 1. Dordrecht: Kluwer Academic Publishers, 423-454. ISBN 9780792363637. All links retrieved February 13, 2017. The Mathematics of the Chinese Calendary by Helmar Aslaksen. This page was last modified on 13 February 2017, at 17:20.